When you think of pizza, you think of thick crust and heavy carbs! 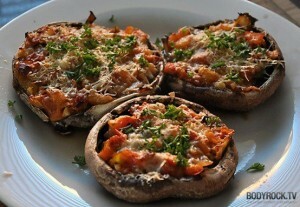 This Mushroom Pizza recipe gives you that pizza fix, without adding all that bread! Try it out and let us know what you think! Saute chopped leeks, garlic, and tomatoes until tomatoes are soft. Add 1 tablespoon of lemon juice to pan, with fresh basil. Stir to combine. On a baking sheet spray mushroom caps with cooking spray. Top with the tomato mixture. Phase 4 may add a little freshly grated parmesan cheese. Bake @ 400 degrees for 12 minutes. Take control of your happiness…you deserve it. Join us tonight, November 18 at 5:30 p.m. for BRIO’s Free Ideal Protein Seminar and find out how you can lose weight safely and effectively. Let BRIO’s expert nutritionists guide you on your journey to greatness. Simply call 841-0150 to reserve your spot. Refer a friend to join the IP program and you receive a $50 IP Product credit. We look forward to seeing you there! For more information about Ideal Protein, contact us today!